We would like to congratulate Sensei Katsutaka Tanaka for his recent reception, on April 26, 2004, of the Foreign Minister’s Award from the Foreign Minister of Japan, Yoriko Kawaguchi, in recognition of Sensei Tanaka’s outstanding contribution to goodwill between Japan and the United States. In celebration of the 150th anniversary of the Japan-United States relationship, Sensei Tanaka’s extraordinary service, commitment, and dedication towards the promotion of mutual friendship between Japan and the United States was commended. Congratulatory remarks were given by the Japanese Consul General Aoki, Lt. Governor Leman, former Governor Hickel, U.S. Senator Murkowski, and via video from President George Bush and Japanese Prime Minister Junichiro Koizumi. 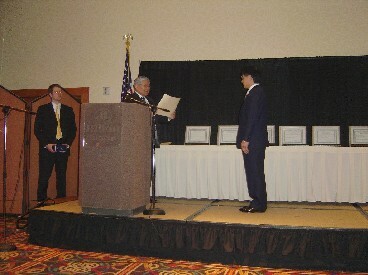 Sensei Tanaka also received congratulatory letters from U.S. Congressman Don Young, U.S. Senator Ted Stevens, and Governor Murkowski. Please join us in honoring Sensei Tanaka’s extraordinary contribution to Japan-U.S relations, culture, and martial arts in the United States.